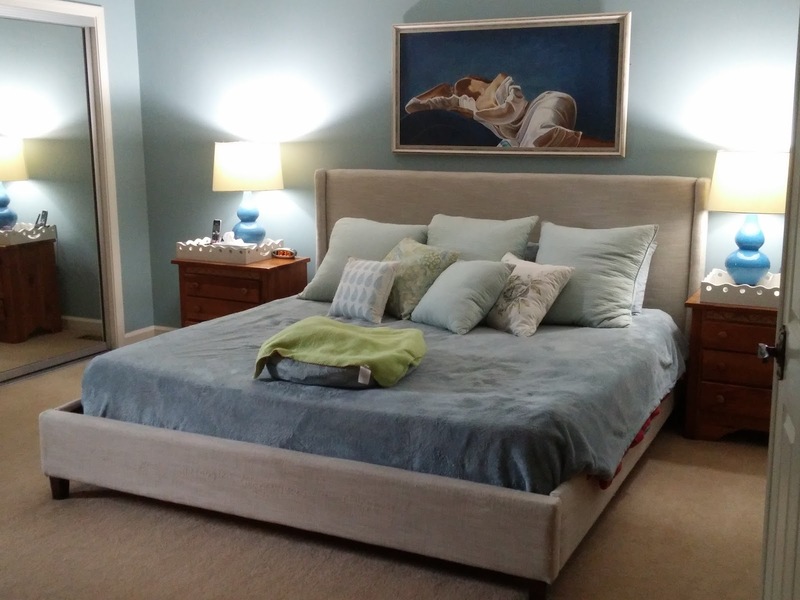 Trying to find an older house with a bedroom big enough for a king size bed can be tricky! We lucked out with this house. All 4 dogs sleep with us so we have to have blankets and a dog bed for them to snuggle into at night! 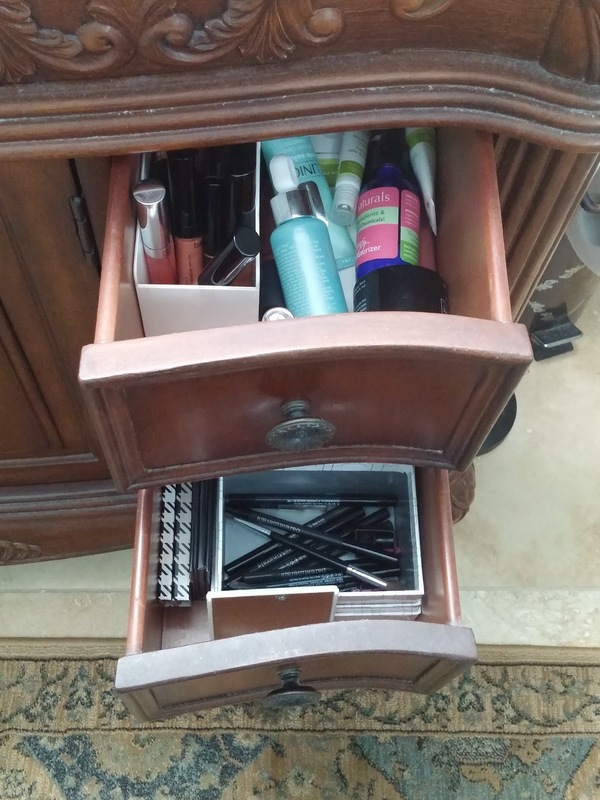 This is my dresser and I honestly keep it clean most of the time. 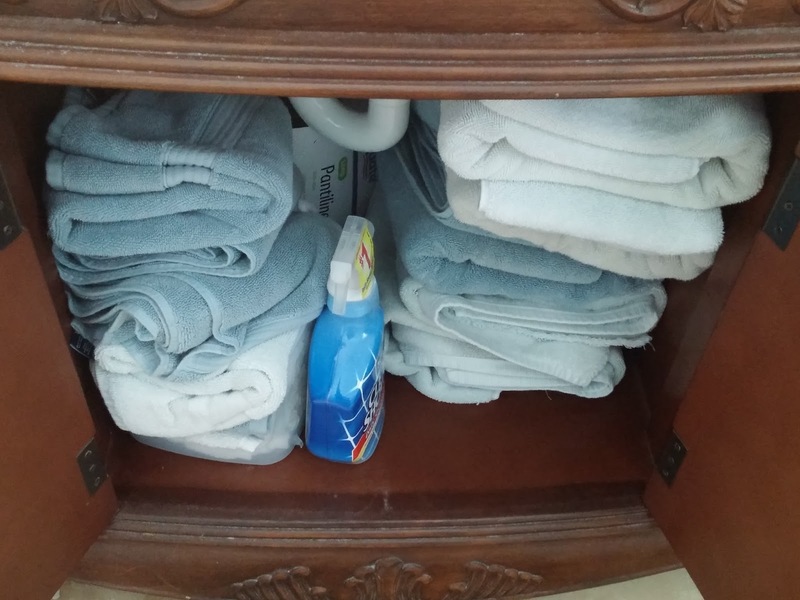 The plastic basket holds lonely socks and the other baskets hold my perfumes. 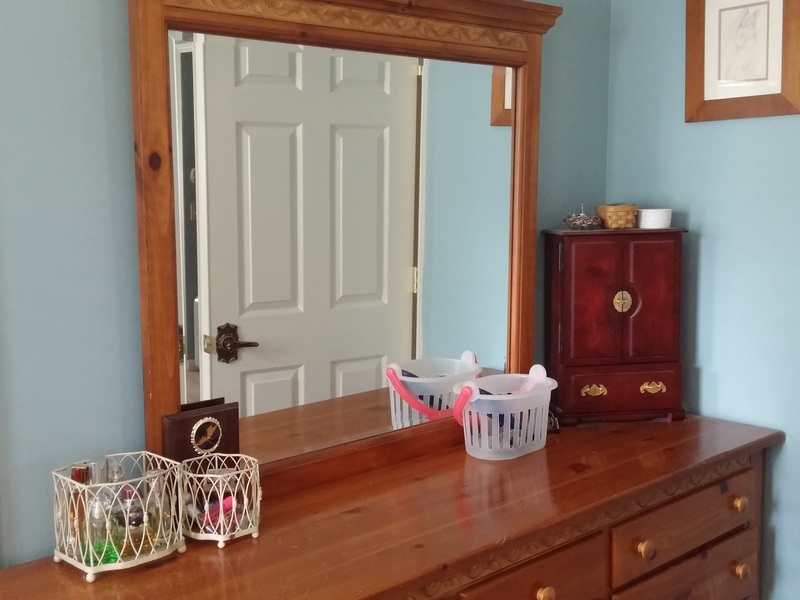 Clothes in the dresser include pajamas, socks, shorts, turtlenecks and a few sweaters ... mostly anything that doesn't need hanging up. Now, for my closet. I arrange clothing by type, so like things are stored together. 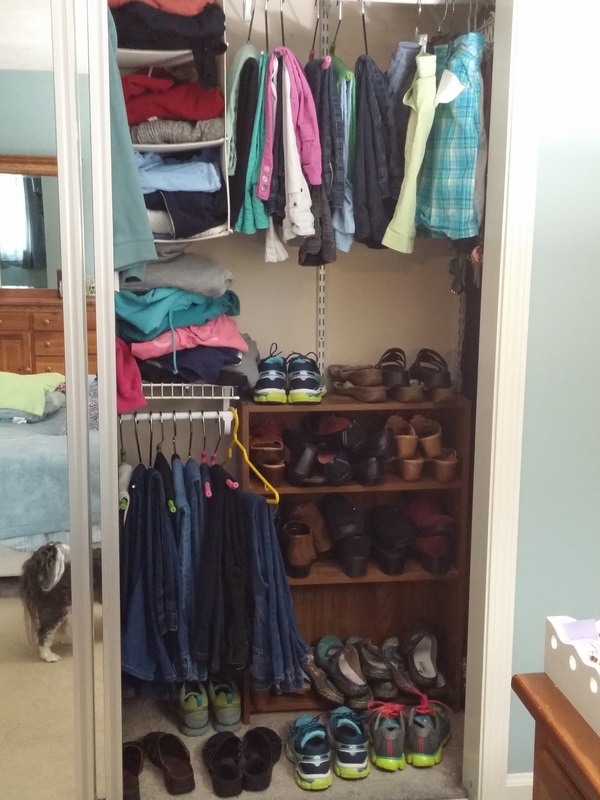 Sweaters and hoodies are stored on the middle shelf and in the hanging container in the top photo. This side of the closet holds jeans, capris and skorts as well as my shoes. I do have boots that I wear only in the winter and they are stored on the top shelf (can't see it in this photo) and switched out with my sandals each year. This side holds all of my tops and vests. Every January, I put all of the clothing on the pole with the hanger hook facing forward. As I wear a piece of clothing and put it back on the hanger, I face the hook towards the back of the closet. 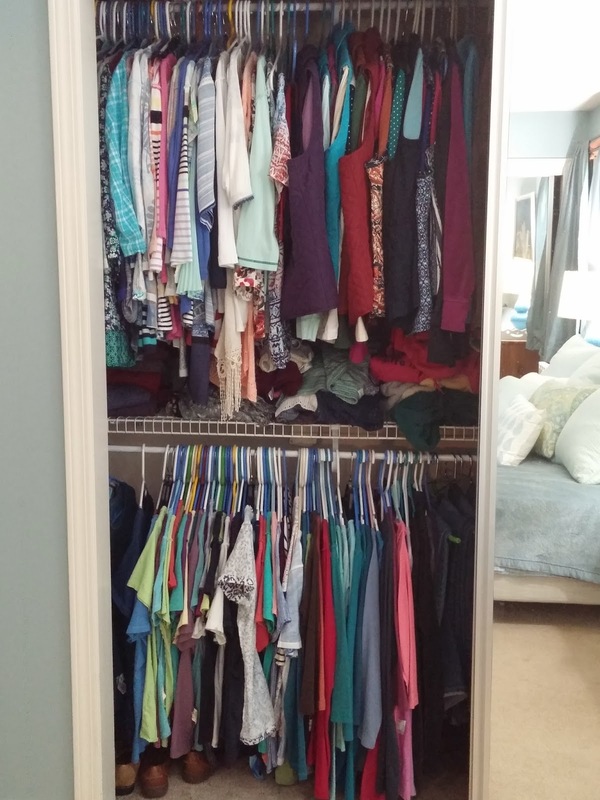 When January rolls around again, I have to take a look at the clothing with the hooks still facing forward and decide if I'm going to keep the items another year or not. If I haven't worn it in a year, will I really wear it next year? After storing some clothing in the craft room, I decluttered and gave away a bunch of clothing this year, so I finally got all of my clothing into this closet and I will not allow myself to buy clothing unless I have space for it in the bedroom. 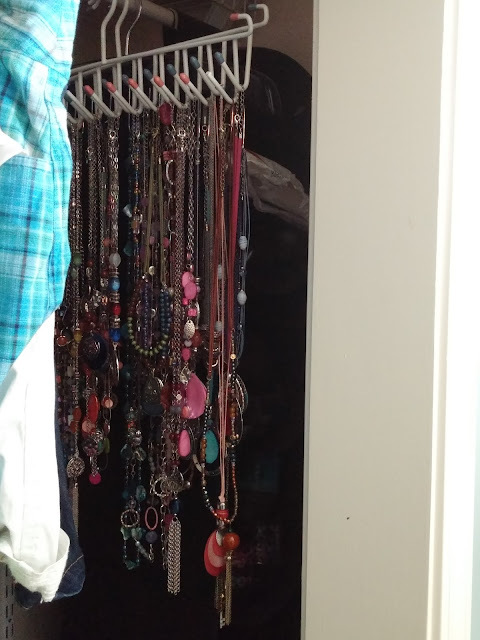 I have a lot of necklaces which are mostly worn in the winter or when going out to eat and I store them on tie/belt racks organized by color. Behind them is another hanging container that holds shoes I don't wear very often, like dressy shoes or boots. I felt it was best to hang them there because it's a hard to reach area anyway! 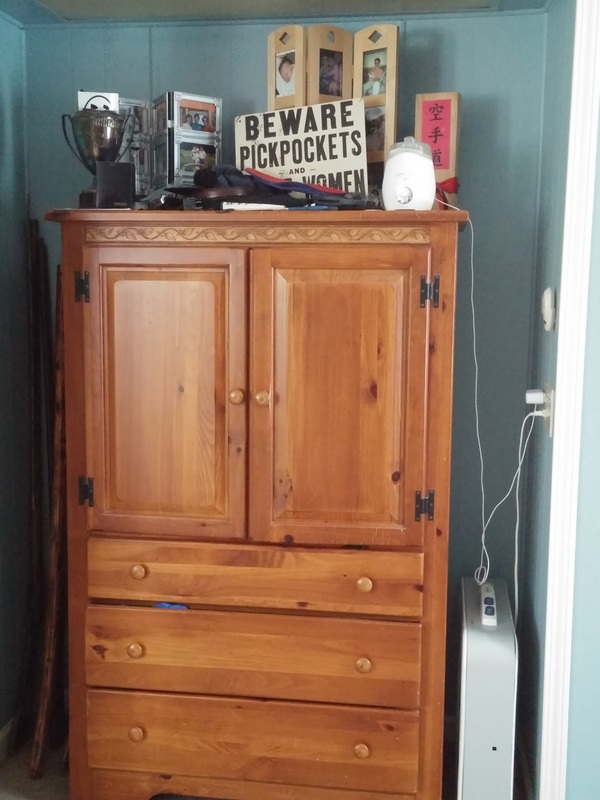 And just to keep it real, here is my husband's armoire which he hasn't decluttered in I don't know how long! That is an essential oil diffuser on the right which I use a couple times weekly to keep the room smelling clean. The box fan is used every night so that I don't hear all of the little noises the dogs make while I am sleeping! Now for our small bathroom. When we moved here, the sink was in the room and only the toilet and shower were behind the door. We fixed that a few years ago and put in a pocket door so that a swinging door doesn't take up extra space. 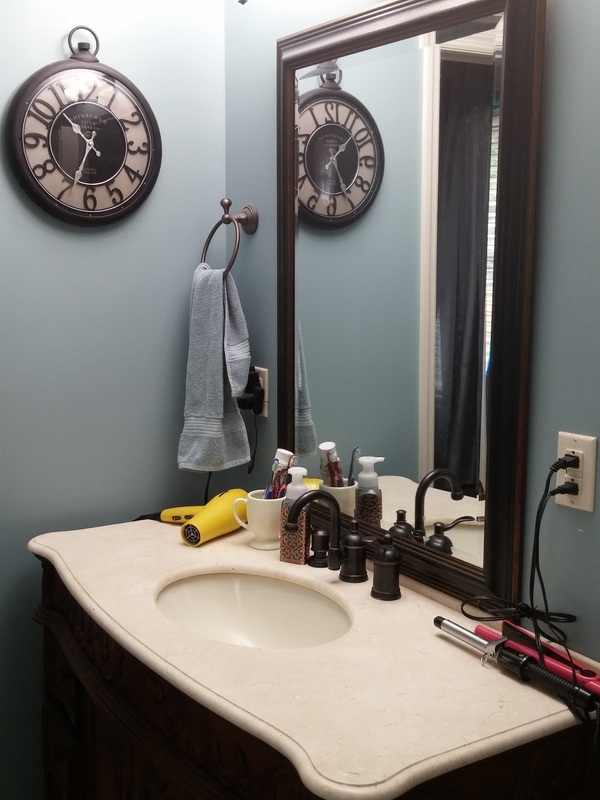 I keep the counters pretty clear thanks to the wall shelf, the basket on the back of the toilet and drawers in the vanity. In the cabinet below, you will see my collection of Bath & Body Works However, I won't be replacing these as I use them up because they are full of ingredients that really are not good for us. Our skin is the largest organ of our body and what we put on it matters! 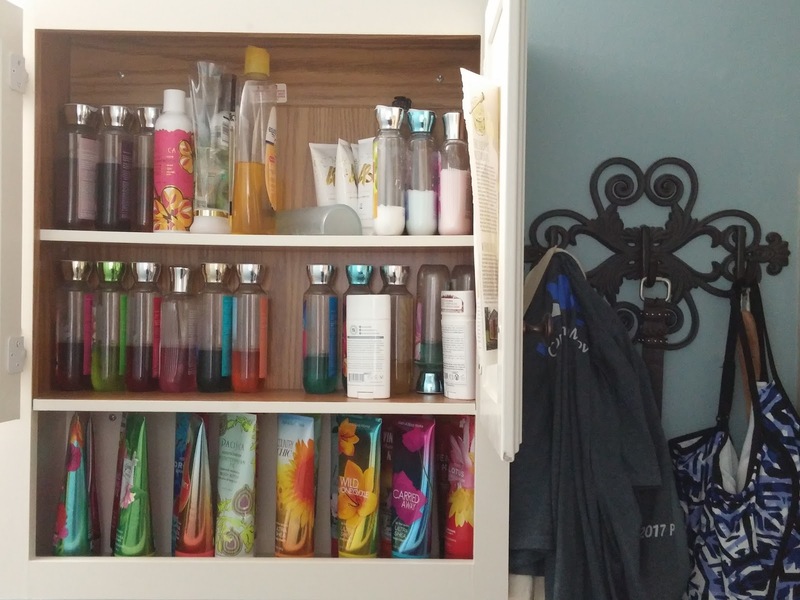 I have found some good natural shower gels and lotions and will be using them beginning in 2018, dumping most of what you see here in the trash. For now, I've decided to enjoy these shower gels and lotions for the rest of the year. I also love having the wall hook unit for hanging pajamas, belts and my bathing suit. 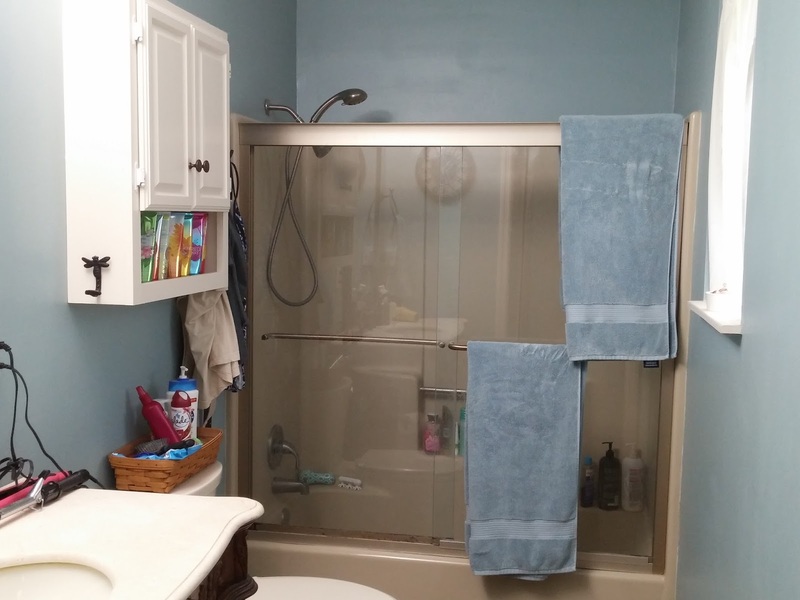 As in the hall bath, all towels are stored below the sink for easy access. It may seem like we have a lot of towels, but the white ones are older ones that we use for bathing the dogs. My facial cleansing and makeup items are kept in various containers inside the drawers. Final room for me to share is my craft room!